A delegation of the Russian Orthodox Church led by Metropolitan Hilarion of Volokolamsk, chairman of the Moscow Patriarchate’s Department for External Church Relations (DECR), arrived in Beirut on 8 December 2012 with the blessing of His Holiness Patriarch Kirill of Moscow and All Russia to attend funeral ceremonies for His Beatitude Ignatius IV, Patriarch of the Great Antioch and All the East. The delegation includes archpriest Nikolai Balashov, DECR deputy chairman; hieromonk Stefan (Igumnov), a DECR staff member; and Mr. Leonid Sevastianov, executive director of the St. Gregory the Theologian Charity Foundation. The delegation was met at the airport by Metropolitan Georges of Homs, H.T. Alexander Zasypkin, Ambassador Extraordinary and Plenipotentiary of the Russian Federation to the Republic of Lebanon; archimandrite Alexander (Yelisov), representative of the Patriarch of Moscow and All Russia to the Patriarch of Antioch; archpriest Anatoly Yegorov, rector of the Russian Orthodox parish in Beirut, and Russia diplomats. 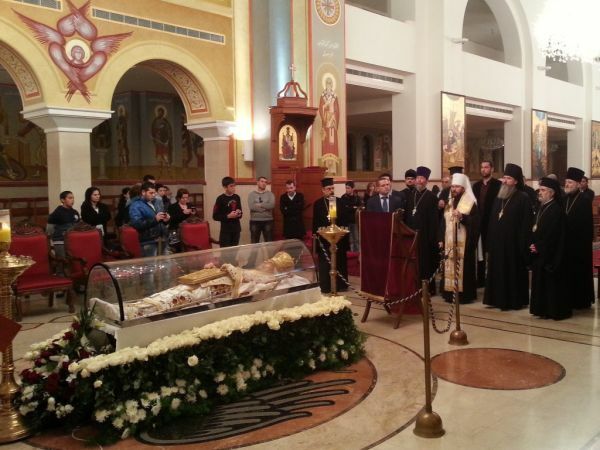 Metropolitan Hilarion proceeded to St. Nicholas Cathedral located in the Ashrafia district of Beirut. He offered up prayers for the repose of Patriarch Ignatius IV of the Great Antioch and All the East at his coffin and was joined in prayers by archpastors and clergymen of the Orthodox Church of Antioch, members of the Moscow Patriarchate delegation, and many parishioners. After the litiya prayers, the DECR chairman talked with the Locum Tenens of the Patriarchate Throne of the Orthodox Church of Antioch, Metropolitan Saba of Bosra-Hauran and Jabal Al-Arab, members of the Holy Synod of the Orthodox Church of Antioch and representatives of the Local Orthodox Church who arrived for the funeral ceremonies. In the morning of December 9, the delegation of the Russian Orthodox Church took part in the funeral service for His Beatitude Patriarch Ignatius.